Today is December 28, a few days before we plan to celebrate the coming new year. Like most Southerners, in keeping with a long time honored tradition I look forward to preparing two of my favorite side dishes which also happened to be traditional New Year' s day recipes for people who come from the South. By far, the two most popular recipes for New Year' s Day are collard greens and black-eyed peas. To be honest, no New Year's Day meal would be complete without serving these two staples. Come January 1st, you will find many Southerners sitting down at the dinner table to eat black-eyed peas and collard greens. Of course you already know that collard greens are said to bring you money throughout the year. If you prefer not to be broke, I suggest you eat some collard greens and watch the money flow in the entire year. On the first of the year it is also important to eat black-eyed peas which are said to bring you good luck throughout the year. If you want to avoid bad luck, I recommend eat yourself some black-eyed peas so that good luck will carry you through the year. 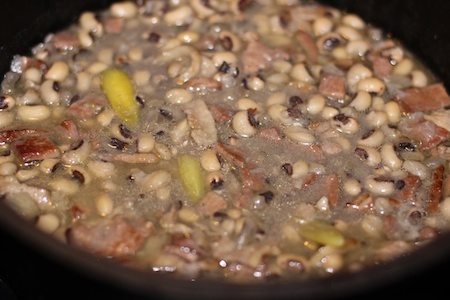 There are numerous ways to prepare black eyed peas, that said, I provide the black eyed peas recipe you see below as just one way of preparing this tasty dish that is said to bring you good luck. For this recipe you’ll need a 1 pound bag of dry black-eyed peas which can be purchased from your local grocery store. Prepare your beans for cooking using the package instructions. Instead of a quick soak, I prefer to soak my peas overnight. After soaked the peas overnight discard the water. Rinse the peas one finally time and set them aside while you prepare the remaining ingredients. Brown diced ham, bacon, and onion in a large pot or dutch oven. Next add three cups of water and bring to a boil. Now add in peas and remaining ingredients of bay leaf, garlic clove, and red peppers before returning to a boil. Cover pot or dutch oven with lid and then simmer on low for 2 hours until peas are tender. Watch the peas as they boil and do not let the water cook out. Before serving your peas add additionally seasoning to taste if required. Serve your black eyed peas along side your collard greens so that you have plenty of good luck and money this new year.